I like Chris Coles. The artist and the man. 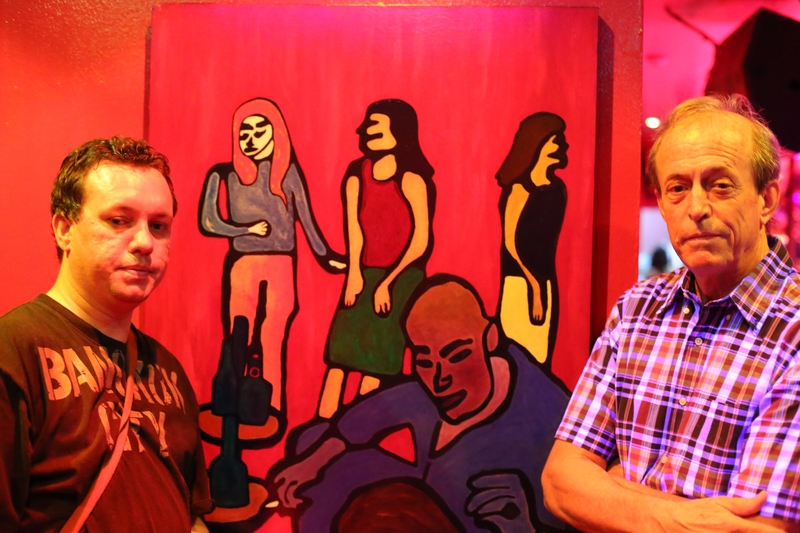 It’s been over 10 years since we first met at a meeting place less than a football field away from Baccara Bar on Soi Cowboy, where James A. Newman, Alasdair McLeod and I recently went to see Chris and his art on Friday the 14th. I wrote a previous piece about Baccara Bar last week partially titled: The Art of Seduction or the Art of the Deal? 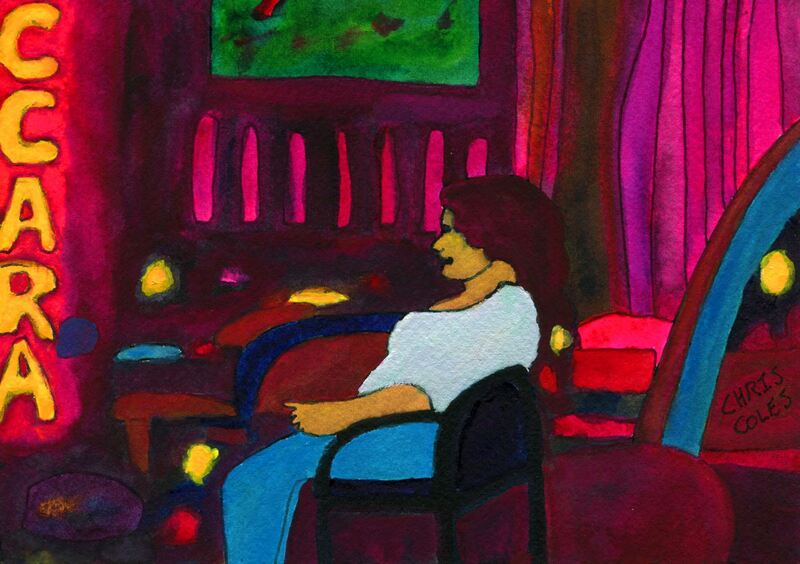 That first meeting occurred because I had stumbled upon the art of Chris Coles on one of his web sites: Chris Coles Gallery Expressionist Art. I found the art interesting a decade ago. I still do, today. 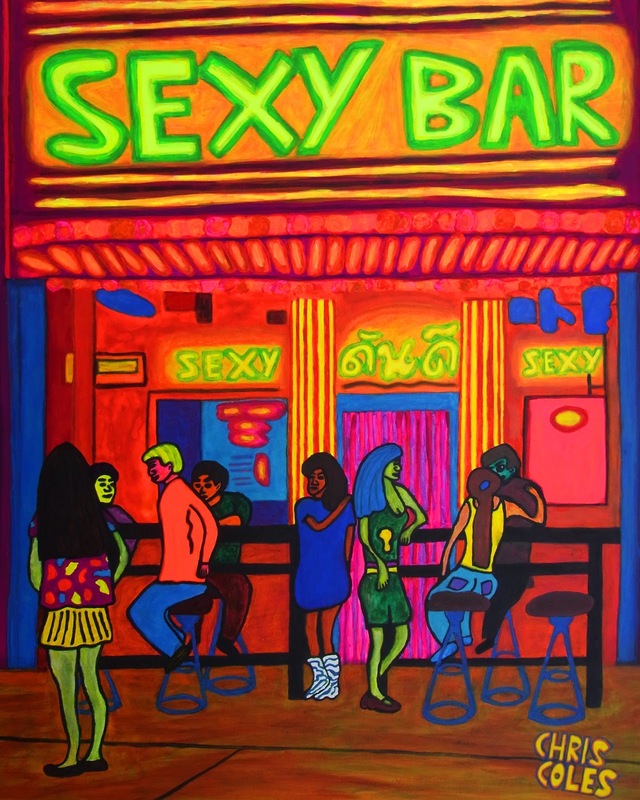 I surmised the man painting about the bright lights and big city of Bangkok might be equally interesting. We arranged to meet. When Chris arrived for that initial meeting I was sitting with a group of 5 or 6 guys around a table. I introduced Chris to the others and conversation ensued. Some interesting. Some mundane. It was always lively, to me, when Chris spoke. I remember thinking, “This guy is the smartest guy in the room.” The fact that the room was the outdoor bar at Tilac on Soi Cowboy, which had 50 or more people scattered about, drinking fluids under a polluted Bangkok night sky didn’t matter. Chris talked about his time in California and the movie business. The big budget film, Cutthroat Island, brought him to the Island of Phuket and eventually Bangkok, where the former Maine resident now calls home. Chris is like the carriage horse of a different color in the movie, The Wizard of Oz. Chris Coles pulls his own weight. There is only one of him and he is it. Meetings with Chris are always memorable. There was a mid-day meal at SUDA restaurant years ago where Chris informed me at our lunch table, “You need to buy, VERY THAI.” A book written by Philip Cornwel-Smith and now in its second edition, with additional photographs by John Goss. After we finished eating we walked to the Time Square Building on Sukumvit 12 and went up the escalator to Asia Books on the second floor. That Asia Books store is now gone. But I still own VERY THAI thanks to Chris Coles. It is a great book about everyday popular culture in Thailand. 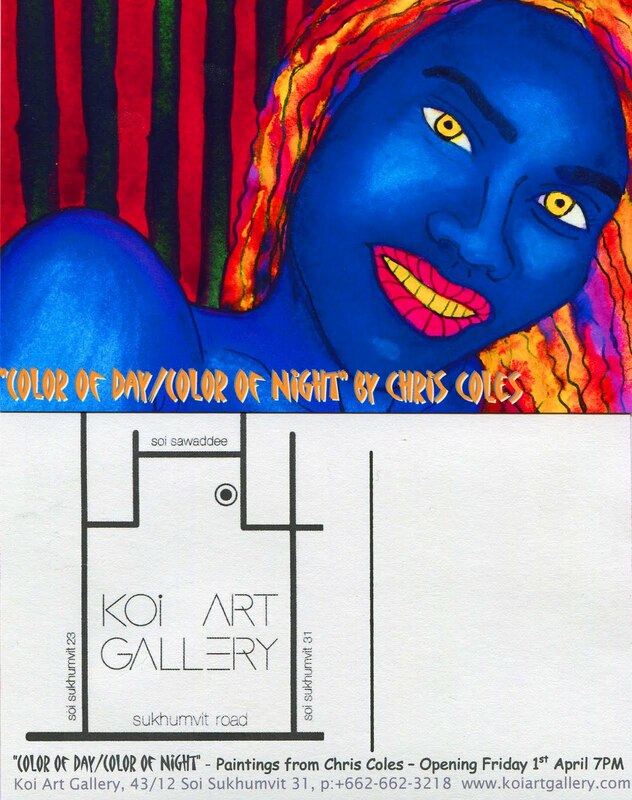 Three years ago, Chris Coles had his art shown at Koi Gallery on Sukhumvit 31. An art exhibition called: Color of Day/Color of Night. One half of the gallery was filled with traditional impressionist paintings of trees and flowers. 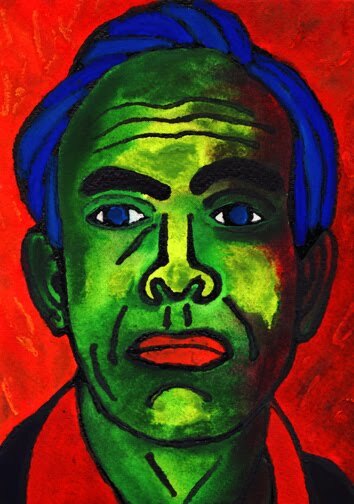 The other side was filled with the large and loud expressionist art of Chris Coles, in the self described style of Emil Nolde, Otto Dix and George Grosz. Coles’ art made the more favorable impression, on me. Chris was spread pretty thin that evening but still made time for me and I met some interesting people on a hot Bangkok night. Another time I took my wife to hear Father Joe Maier speak, the American Catholic priest that lives and works in the Klong Toey slums. We had a dinner table reservation. 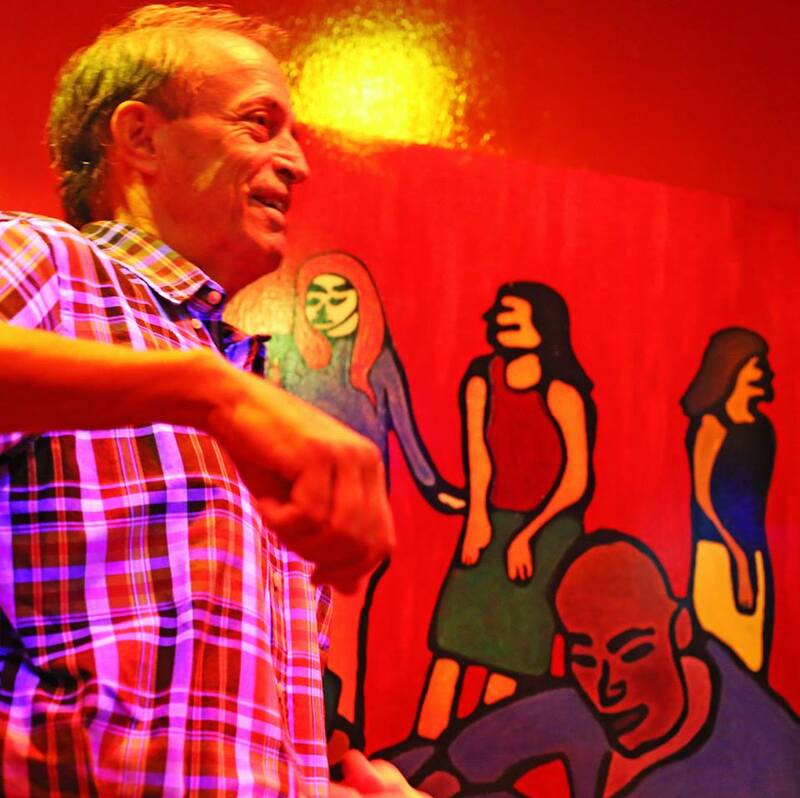 Chris Coles was sitting at the bar in the packed Foreign Correspondent’s Club of Thailand. After Father Maier finished his very entertaining speaking engagement, Chris came over to our table, despite the fact he probably knew over 50% of the people in the large room. He spent thirty minutes talking to my wife about painting, colors, medium, style and art. My wife appreciated it and so did I. 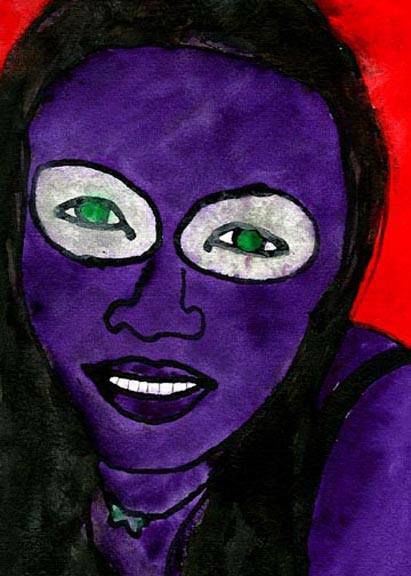 She had begun taking art classes at our community college in California. Chris had seen some of her work and shared his experiences and enthusiasm. Memorable table conversation, again. That prompted a call to my wife, “Honey, I’ll be home later than I said. Chris Coles just arrived.” She understood. She likes Chris too. Chris is the kind of friend that will let you know when you have put on an extra 10 pounds. He’s also encouraging – to my wife, to me and to others. As Chris puts it in the video interview with James A. Newman, “You need to bring something to the Bangkok night. And then make something out of it.” I appreciate Chris Coles. I also like and appreciate the fact that he has some critics. Show me a man with critics and I will show you a man with accomplishments. Fast forward to Friday the 14th. Our group of four had just finished eating our dinners at Queen Victoria Pub. Big dinners. Bangers and Mash kind of dinners. We were to meet Chris at Baccara on Soi Cowboy. One of three infamous Entertainment Zones catering to foreign tourists and expats living in Bangkok. Someone joked that no one has ever seen Chris eat dinner, which may explain how he maintains his weight better than most in the City of Angels. Chris is not a starving artist, by any means. But he certainly knows how to paint the overweight, contrary and even the ugly side of life. Chris Coles paints Bangkok realities, not American fantasy. Thomas Kinkade he is not. 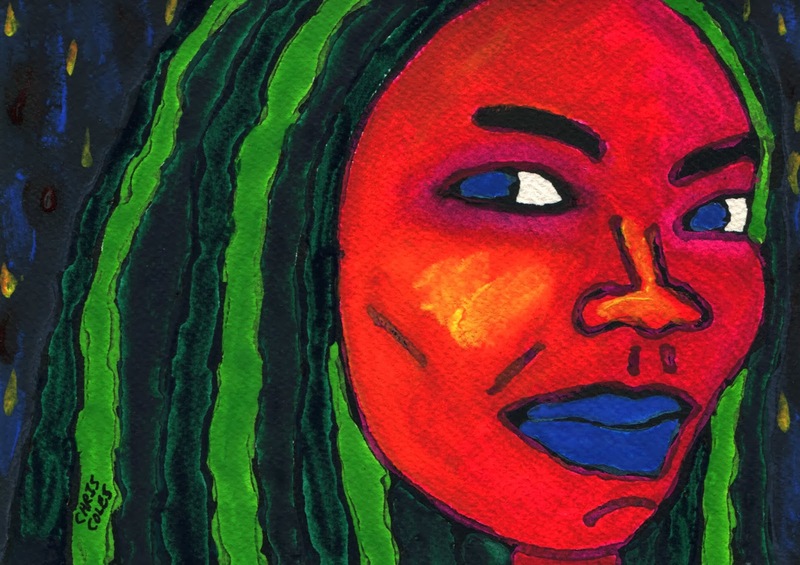 The art made by the Ivy League graduate and father of an M.I.T grad daughter has been exhibited in at least four countries. His clientele is diverse, ranging from Baccara owner Patrick to people close to the Royal family, well known authors, art collectors and even a blogger or two. Chris Coles was waiting outside when we arrived, at a table in front of Baccara Bar, wearing one of his trademark plaid shirts and Levi 501 jeans. We had permission from the owner, Patrick to photograph inside and videotape outside; we had Chris Coles for a tour guide, he had agreed to a video interview and it was Friday night in Bangkok City. No one was talking politics and no one was complaining. We went to the second floor of Baccara, where three of Coles’ paintings are showcased. The first floor and second floor of Baccara are quite different in atmosphere. If you have trouble making up your mind where to spend your time you need only look through the glass ceiling or glass floor, depending on your point of view. To get to the second floor one must climb up a spiral staircase, where at the top you will see this Chris Coles painting: [Addendum: fire on 2nd and third floor of Baccara Bar in early May, 2014 destroy three of four Chris Coles paintings – see them here]. James A. Newman, who writes about the entertainment zones in entertaining fashion interviews Chris Coles on video, in the thick of the Red Night Zone. Sit back and enjoy this revealing segment from the interview put together by Alasdair McLeod. You’ll learn what motivates Chris Coles to paint the Bangkok night, whether he goes looking for his subjects or makes them up at times? The thought behind the atmosphere at Baccara and whether a pulp fiction writer drinks white wine or red? The Bangkok night can be a big nightmare or a big party. But like any good party you are invited to, as Chris Coles suggests, it’s never a bad idea to bring something to it. Thanks for this illuminating take on Chris Coles and his art. I’ve followed his work for a few years now and argued with more than a few friends about its value. Some see ugly and childish, others see an X-Ray vision of humanity revealed in the extremes of degeneracy and decadence. I see a straightforward insight into who we are and how far we need to go. Thanks for your comment, Phillip. It’s a conversation worth having. And one that wouldn’t take place without Chris Coles.